Wet scrubbers and dry media dust collectors are two very different technologies used to capture dusts generated during production processes. Both types have inherent advantages and disadvantages. Which is best for your application? 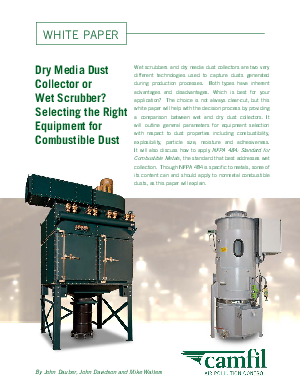 The choice is not always clear-cut, but this white paper will help with the decision process by providing a comparison between wet and dry dust collectors. It will outline general parameters for equipment selection with respect to dust properties including combustibility, explosibility, particle size, moisture and adhesiveness. It will also discuss how to apply NFPA 484: Standard for Combustible Metals, the standard that best addresses wet collection. Though NFPA 484 is specific to metals, some of its content can and should apply to nonmetal combustible dusts, as this paper will explain.